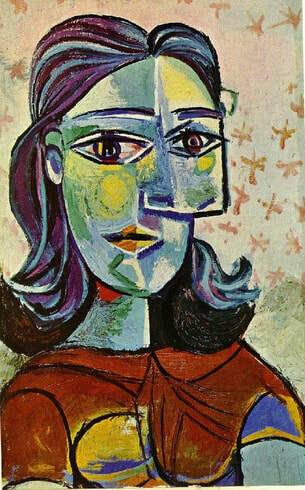 Pablo Picasso, born in Spain, was known as an artist who invented new methods and styles of art. He had a very big influence on art from his lifetime up to the present. Picasso was born in 1881 and lived to be 92. Throughout his long life, he created and experimented with art techniques. He is credited with being a founder or an important part of multiple new styles of art, such as Cubism and collage art. Unlike many artists, he achieved fame and even fortune within his lifetime. He is so well-known that his name is sometimes used to describe a great artist. Such as: She’s a regular Picasso! Our painting of the week is Picasso’s Three Musicians. 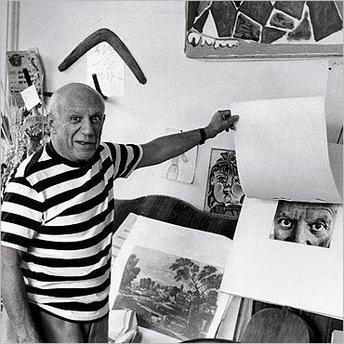 Pablo Picasso’s full name is very long: Pablo Diego José Francisco de Paula Juan Nepomuceno María de los Remedios Cipriano de la Santísima Trinidad Martyr Patricio Clito Ruíz y Picasso. His names honor a variety of relatives and saints. Though Picasso was not a very good student in school, he showed much talent for drawing at a young age. 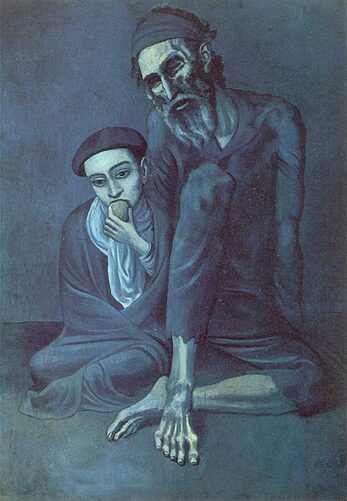 Picasso's father began teaching him to draw and paint when he was a child, and by the time he was 13 years old, his skill level had surpassed his father's. 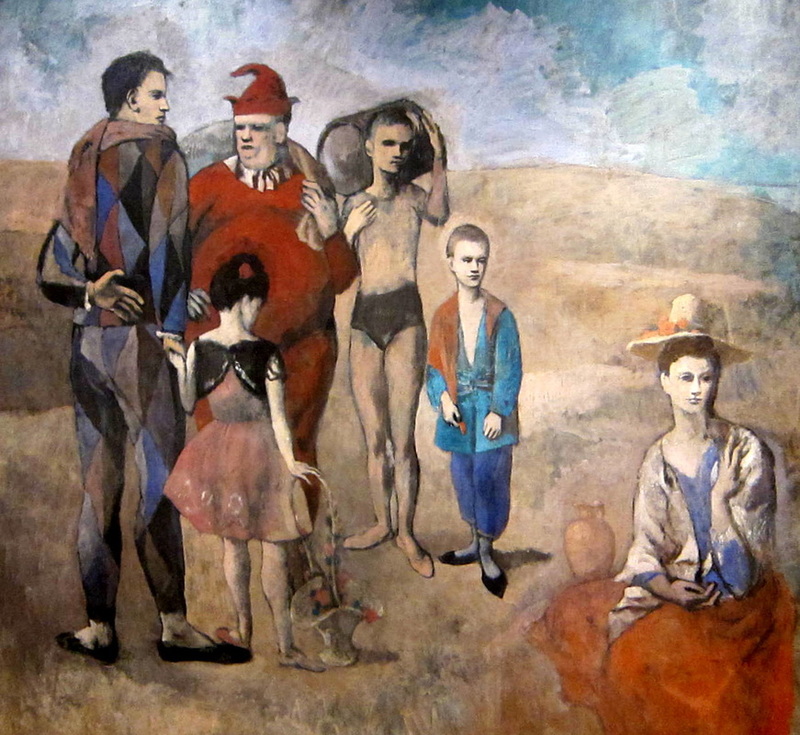 When Picasso was 14 years old, he moved with his family to Barcelona, Spain. 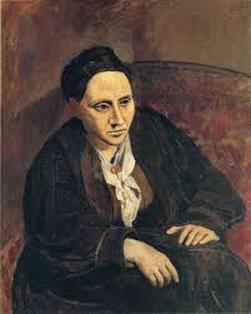 Because of his excellent entrance exam, Picasso quickly was granted acceptance into the city’s prestigious School of Fine Arts even though he was younger than most students. But Picasso did not like the rules and ways of the school, and he began skipping class so that he could roam the streets of Barcelona, sketching the city scenes he observed. 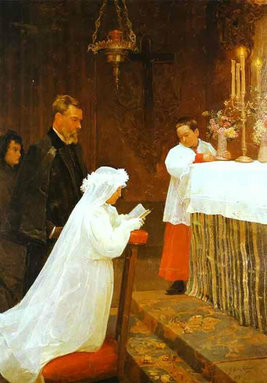 Picasso completed the painting, First Communion, at age fifteen. Picasso was sent to a top art school in Madrid, but once again he did not like it. However, he did like going to the Prado Art Museum and studying the works of El Greco and other artists. 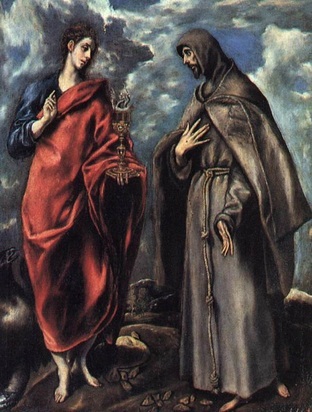 Elements from El Greco’s paintings, such as longer than normal arms and legs, echoed in some of Picasso's later work. 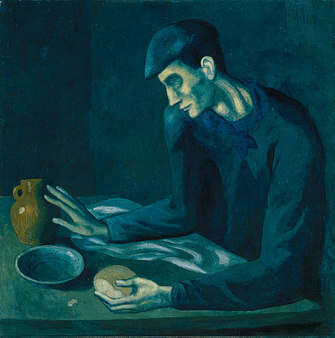 Picasso soon made a break from the classical methods in which he had been trained, and began what would become a lifelong process of experimentation and innovation in art. 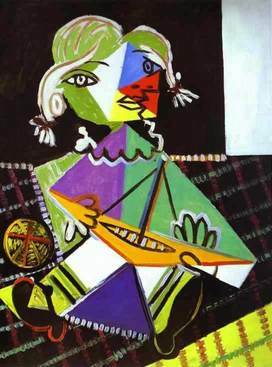 Picasso created art over a long period of time. His art is often broken up into periods of time according to the styles and techniques he was using. His first period lasted from 1901 to 1904 and is often called his “Blue Period.” Blue is the dominant color of his paintings from these years. 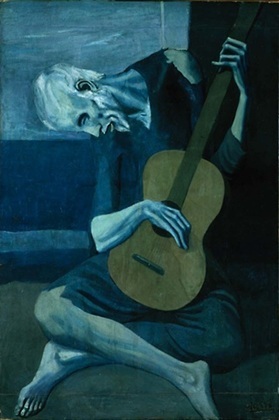 Picasso was lonely and depressed over the death of a close friend. He painted scenes of poverty, loneliness, and sadness during this time. 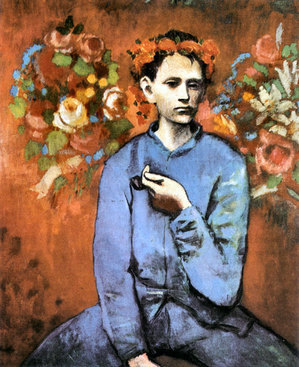 By 1905, Picasso’s spirits improved and he entered his “Rose Period”. These paintings have warmer colors such as beiges, pinks, and reds. They often feature circus people, acrobats, and harlequins known in France as (sawl-tim-bonks) saltimbanques. 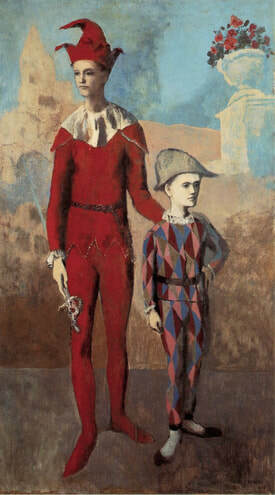 The harlequin, a comedic character usually depicted in checkered patterned clothing, became a personal symbol for Picasso. His most famous paintings from these years include "Family at Saltimbanques" and "Gertrude Stein". 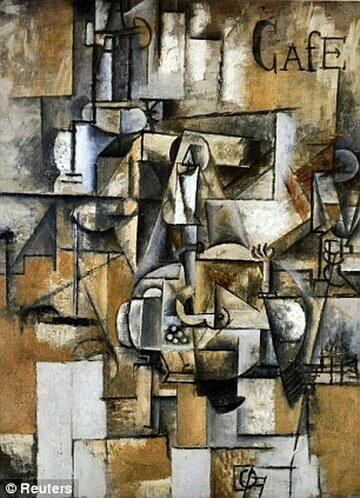 Cubism is a style of painting Picasso developed along with another artist, Georges Braque. 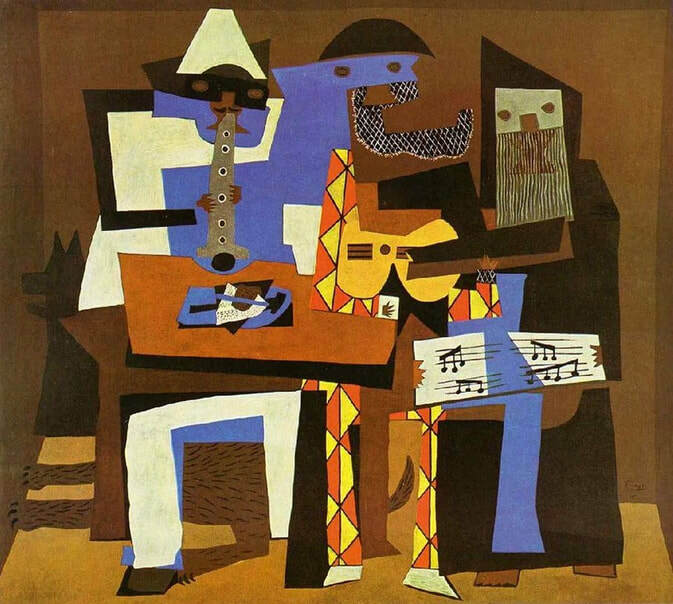 Three Musicians, our painting of the week, is in a style of Cubism (notice the Harlequin in that painting). Cubist art shocked and fascinated the art world. 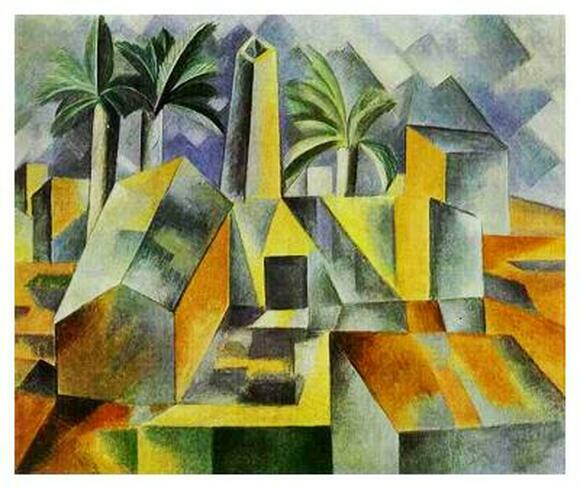 Cubist paintings use geometric shapes and attempt to show multiple viewpoints of an object at one time. 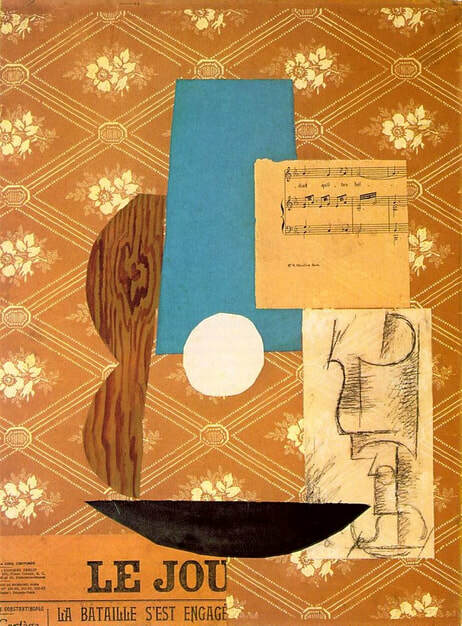 Picasso began making art by cutting and pasting paper, such as wallpaper or parts of newspapers. 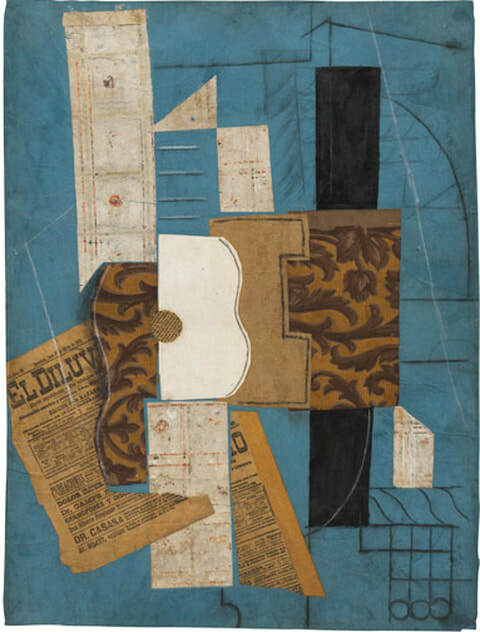 These were the first uses of collage in fine art. 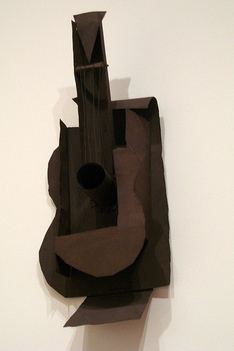 Much of his art was based on objects of the real world such as guitars, violins, and bottles. From 1927 onward, Picasso became caught up in a new movement known as Surrealism. Picasso's most famous painting is Surrealist in nature and was completed in 1937. The mural-sized painting (11’ by 25.6’) is called Guernica, after a Spanish town that was bombed during the Spanish Civil War. The only colors in the painting are black, grays, and white. The painting features a minotaur and several human-like figures who show terror and agony. A minotaur was a creature from Greek mythology who had a bull’s head and a man’s body. 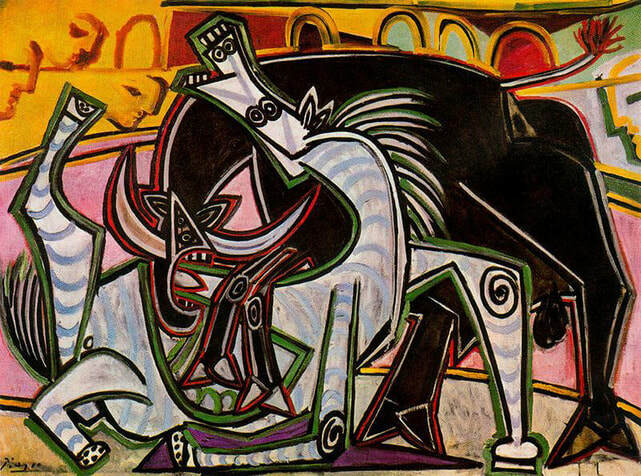 During the 1930s, the minotaur replaced the harlequin as one of Picasso’s favorite figures in his work. 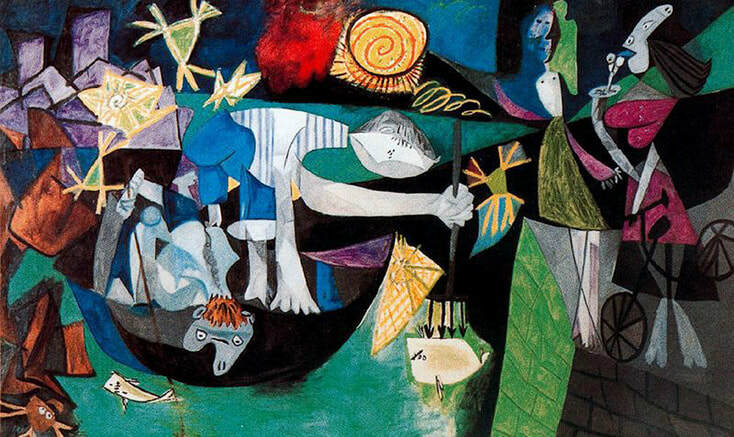 Picasso painted Guernica to express his outrage at the bombing of the town and at the horror of war. It is considered to be one of the most powerful anti-war paintings ever created. Picasso was primarily a painter, but he also created sculptures. His early sculptures were carved from wood or modeled in wax or clay, but he abandoned carving and modeling. He created a new sculpture technique by combining a variety of materials. 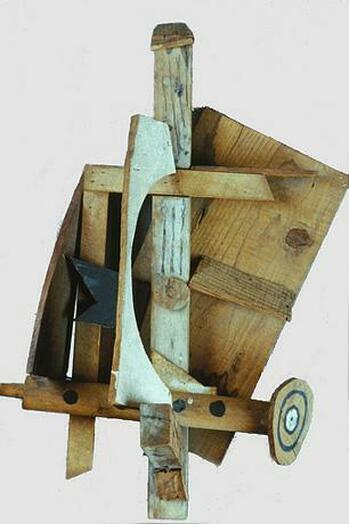 Just as collage uses a mixture of materials, his sculptures used a combination of objects. This was a very different way of creating sculpture from the traditional modeling and carving of the past. His new method of sculpting is called constructed or assembled sculpture. 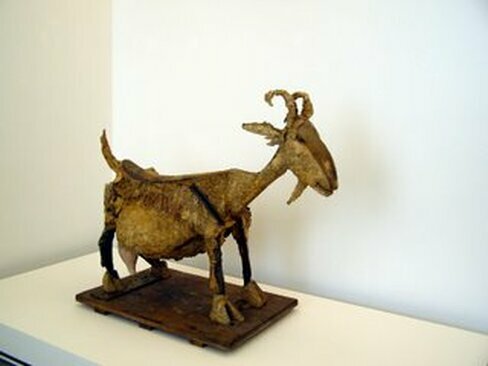 His Goat sculpture was assembled with a wicker basket body, palm leaf back, ceramic flowerpots, and other metal elements that were afterwards cast in bronze. 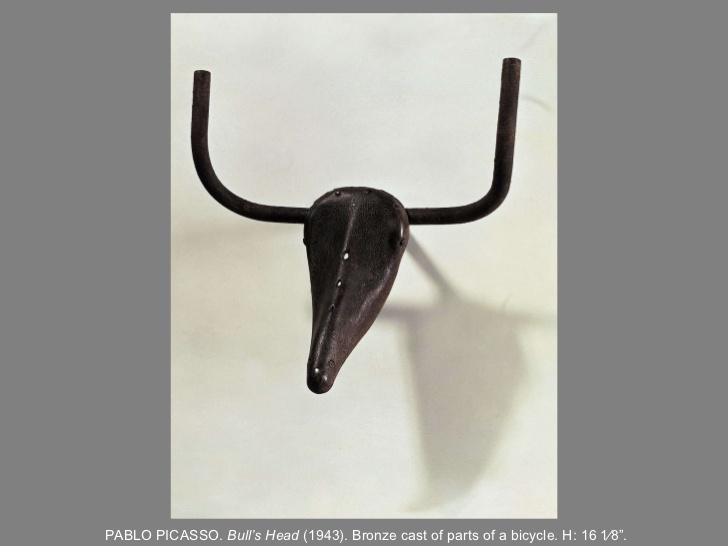 Bull’s Head was made from bicycle parts. 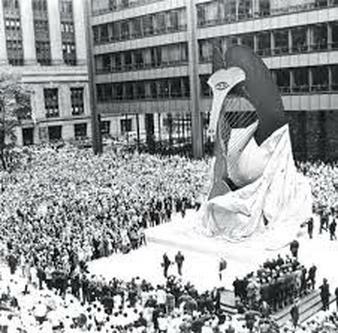 The City of Chicago commissioned Picasso to create a huge 50-foot public sculpture for Chicago. He finished the sculpture in 1967 and instead of accepting the $100,000 he was owed, Picasso gave it to the people of the city for free. 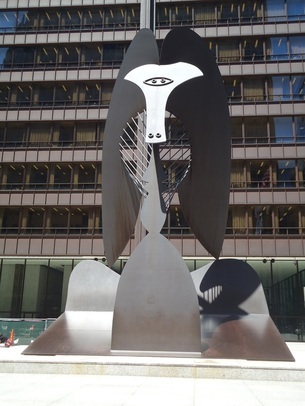 The sculpture is known simply as the Chicago Picasso. It’s left to each viewer to decide whether it represents a bird, animal, person, or an abstract idea. Picasso once said: "Every child is an artist. The problem is how to remain an artist once we grow up.” Picasso grew up to be one of the most famous and important artists ever. He is respected for being someone who co-founded Cubism, first used collage as art, invented constructed sculpture, and developed and explored a wide variety of styles that influenced the world of art.